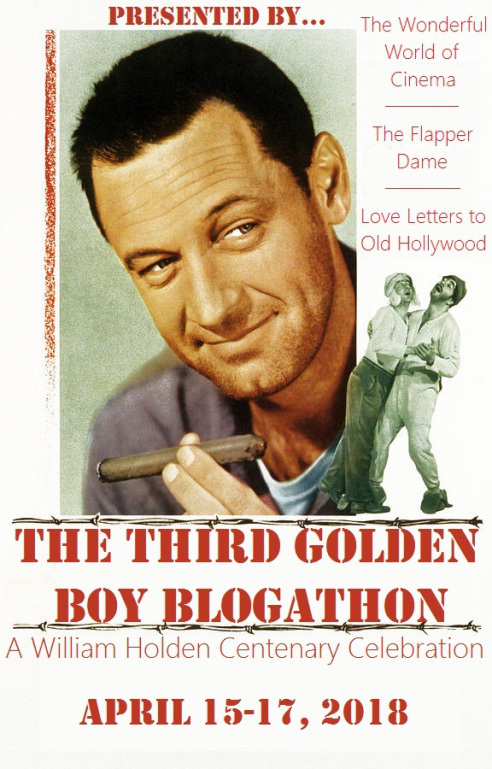 The Third Golden Boy Blogathon, A William Holden Centenary Celebration is underway April 15-17. 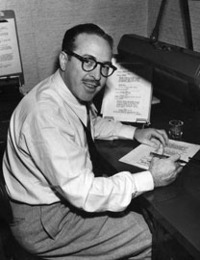 Some people have an awful lot to say, and writer Dalton Trumbo was one of those people. The newsman and novelist began his Hollywood career as a studio reader, summarizing and recommending projects for filming. His first screenplay, the "B" film Road Block was produced in 1936. 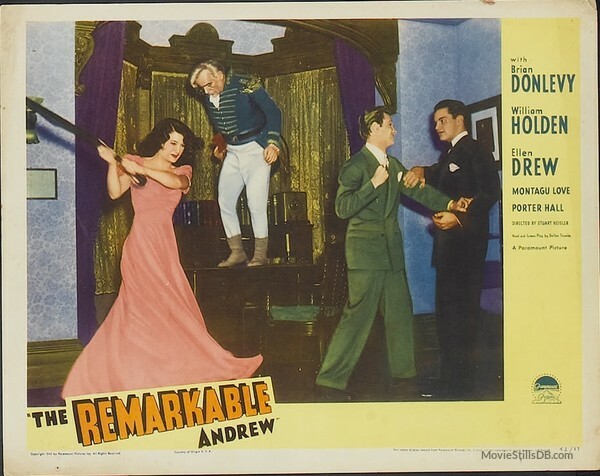 Trumbo adapted his novel The Remarkable Andrew for the screen in 1942. The story is set in Shale City, Colorado, a fictional stand-in for his hometown of Grand Junction. Perhaps the character of Andrew Long played by William Holden is a fictional stand-in for the naive youngster Trumbo may have been. The Remarkable Andrew is at its core a civics lesson wrapped in the sugary spun coating of a comedy/fantasy. The philosophy and doctrines espoused by our leading character are made all the more appealing and relatable as given by an appealing and relatable star. Golden Boy, the 1939 film that was 21-year-old William Holden's make or break role, made his career thanks to the support of his co-star Barbara Stanwyck. His follow-up roles played on Holden's fresh-faced image and natural likability. The Remarkable Andrew follows in that mold. We like Andrew Long of Shale City, Colorado. Andrew Long is a bookkeeper for the City. When he discovers a discrepancy in the books, he is compelled to honestly bring it to the attention of his superiors. It soon becomes apparent that every one of those superiors from the Chief Clerk to the City Treasurer to the Mayor to the District Attorney is covering up their own malfeasance. Should Andrew take the offered raise in pay and keep his mouth shut? Not this boy! Andrew's three times grandfather was an officer under General Andrew Jackson and that personage is Andrew's legacy hero. Here are some of the sayings attributed to the General that motivate our young hero. "Do what is right ... That is what the law always means." "Part with existence before you depart from virtue and honesty." It is plain that Andrew has no choice but to put his reputation on the line and confront the crooked politicians. Andrew's plight is such that in the after-life, his three times grandfather Ezra has hounded General Jackson into giving the situation his personal attention. Andrew is at first shocked and confused by the appearance of the spirit of his idol appearing in his boarding house room but quickly adapts. Jackson, as portrayed by Brian Donlevy, is such a boisterous and overbearing chap that he cannot be ignored or dismissed. The tee-totaling Andrew shocks his neighbours when he starts purchasing copious amounts of Old Maryland Rye, the drink of choice for the General. Andrew's intended, Peggy played by Ellen Drew, tries her best to be supportive. This is not an easy task as Andrew is walking down the street apparently talking to himself when he is talking to the General. Everything people hear of the one-sided conversations sounds suspicious. General Jackson has one opinion on how to deal with the "Rascals and poltroons every one of them!" He advises his young namesake to "Hang 'em! You show me a politician with heels ten feet in the air and by Judas Priest I'll show you an honest politician!" Poor Andrew has lost his job, his standing in the community, and possibly his girl. The forces against him throw him in jail. Andrew will be tried for the crimes of his accusers. General Jackson is incensed. "You've been trying to keep an honest accounting of City money. You've been dealing with politicians. You've been standing up for your own rights. Naturally, you landed in jail." The only lawyer available to Andrew is out of town leaving him feeling alone, but he will not be isolated for long. General Jackson has assembled a team of helpful spirits with an interest in seeing right done. Montagu Love is General George Washington, Gilbert Emery is Mr. Thomas Jefferson, Brandon Hurst is Mr. Chief Justice John Marshall, George Watts is Dr. Benjamin Franklin, Rod Cameron is Jesse James (jailbreak expert) and Jimmy Conlin is Private Henry Bartholomew Smith (a guy who's taken more orders than anybody). 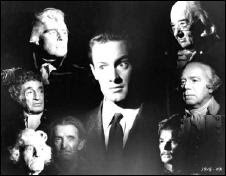 Minor Watson plays District Attorney Orville Beamish and he plays it to the hilt as he disparages Andrew to the jury. "Look at him - sullen, morose - of questionable sanity. Given to furtive reading instead of that red-blooded exercise that has made our youth the envy of the civilized world. Mark you well, this constant reading is the sign of the radical, the agitator, the spy, the thief." Andrew defends himself to the jury most eloquently. Dalton Trumbo would not allow him to do otherwise. Imagine the forthright and honest performance of William Holden giving this speech. "I think I'll answer Mr. Beamish's criticism of what I read. Mr. Beamish has been talking all the time about democracy and how I'm subverting it. As a matter of fact, everybody now seems to be talking about democracy. I don't understand this. As I think of it democracy isn't like a Sunday suit to be brought out and worn only for parades. It is the kind of a life a decent man leads. It's something to live for and to die for. I hope that what I am trying to say doesn't sound like flag waving because I've always felt that flag waving was something sacred and quiet, and not to be done for any selfish motive. But Mr. Beamish has started this and I'm only defending myself as well as I know how." "Mr. Beamish has told you what democracy means to him. I think I ought to tell you what it means to me. Democracy means that people can say what they want to, all the people. It means that they can vote as they wish, all the people. It means that they can worship God in any way they feel right and that includes Christians and Jews, and VooDoo doctors as well. It means that everybody should have a job if he's willing to work. And an education. And a right to bring up his children without fear of the future. And it means that old should be provided for without shame to themselves or to their families. It means do unto others as you would have others do unto you. It also means the prayers of the pilgrim fathers in the wilderness, and the Declaration of Independence, and the Constitution of the United States, and the Bill of Rights, and the Emancipation Proclamation, and the dreams of an immigrant mother for her children. And that's what I believe in. If I'm wrong send me to jail. If I'm right just give me a fair chance to prove my innocence. I ... that's all, I guess." While Andrew is being vilified in court, his ghostly legal team roams the halls of city government looking for evidence to assist their young client. Eventually, they come across recordings of the conspiracy which General Jackson, in his enthusiasm, breaks. However, Chief Justice Marshall boasts an impressive memory and recalls the conversation verbatim which they pass onto Andrew. Andrew presents this to the court in a most judicious manner and in the course of an adjournment, all of the "petty-foggers, gamblers and masters of chicanery" resign their posts. Andrew is appointed City Treasurer. It is easy to draw a direct line from The Remarkable Andrew's Andrew Long to Dalton Trumbo's testimony before HUAC later in the decade. However, I can't let politics negate the obvious fact that The Remarkable Andrew is also a very funny and sweet movie with winning performances from Holden and Ellen Drew. Holden takes Andrew Long from a go-getting young man to an apparent nut-case publically going off his rocker, to a studious defender of justice. 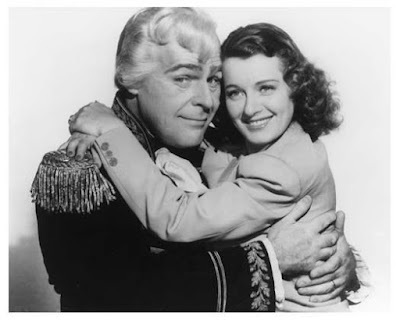 Ellen Drew is a charming, yet frustrated fiancee, and her attacking her unseen rival, the General, is terrific slapstick. Brian Donlevy gives us a memorable characterization as the ghostly embodiment of a rollicking Andrew Jackson. Paramount gave director Stuart Heisler (Along Came Jones, The Biscuit Eater) a bevy of fine character actors for the historical figures, and for those populating fictional Shale City. Porter Hall as Andrew's immediate boss, Helena Phillips Evans as Andrew's landlady, who takes on cops and the court in his defense, Tom Fadden as the clerk who sells the rye, and Richard Webb as a romantic rival are all spot-on and very funny. Trumbo's script combines political beliefs, a history lesson, and a fast-paced, sweet-natured screwball comedy. No small feat, and a treat for classic film fans and fans of an actor of the career and calibre of William Holden. Dang- why is it so hard to track down these films- I'm all in for lesser known but good movies. 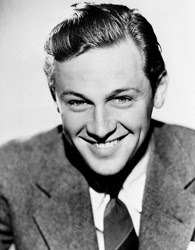 I like watching young Bill Holden- and its so cool to see him develop into this professional actor- Thank you so much for participating in this blogathon and sharing your love of Mr Holden! Years ago a friend made a DVD copy of this movie for me and despite the poor quality of the print, the exuberance of the cast came through. Well, this sounds like fun! I can always count on you to bring forgotten gems like this to my attention. It's funny -- while reading this, I couldn't help but think of the Disney film Blackbeard's Ghost with Peter Ustinov and Dean Jones. Could be quite the interesting double feature! Thanks for writing this fabulous post for the blogathon! Pairing this with Blackbeard's Ghost would be a lot of fun. I watched that when TCM took it out of the Disney vault after having not seen it since I was a kid, and really enjoyed it. Thank you for your hosting duties. We'll be doing this again sometime. I have never even heard of that movie. It sounds like one of those very charming, very old-fashioned movies they don't make anymore. I'll try to track it down. So many of Holden's films from the 40s, before he made it really big, seem to be neglected. He was never really appreciated his 40s movies and considered most of them nothing but fluff unfortunately. It is an odd and enjoyable little movie, and the burgeoning talent of William Holden is its chief asset. He had the goods as a young actor, but it took maturity and the right roles to let him really shine. I can't believe I've never heard of this film. It sounds positively charming and inspiring! Thanks for sharing. I'm pleased to think I am the one who introduced you to this little gem. Excellent and well-detailed review Patricia! I didn't know it was adapted from a Dalton Trumbo novel! I don't remember everything about this film because it's been a while, but I remember it as highly enjoyable and starring a young and adorable William Holden! My favourite part is when Andrew Jackson asks him for a drink and he offers him grappe juice hahah. Thanks a lot for your contribution to our blogathon! Yeah. The General isn't going to put up with any of that nonsense. Young Holden had to play the steady rock to Donlevy's energetic spirit, and they worked very well together. William Holden looks so young in that first photo! I haven't seen this movie in decades, so it's another one that I need to revisit. I've always been a William Holden fan. He had such an innate appeal that I always find myself rooting for his characters, even when he played those with questionable motives in films like THE WILD BUNCH. It's true. Whatever Bill is doing, we want to be on his side. He doesn't need us, but we wish he did.